If Rigs Counts Are Rising, Why Did These Rig Stocks Decline in March? You have to look past the simple macro trend to see why these companies didn't do well last month. Despite the improving environment for rigs in the U.S., land drillers took a nosedive in March. 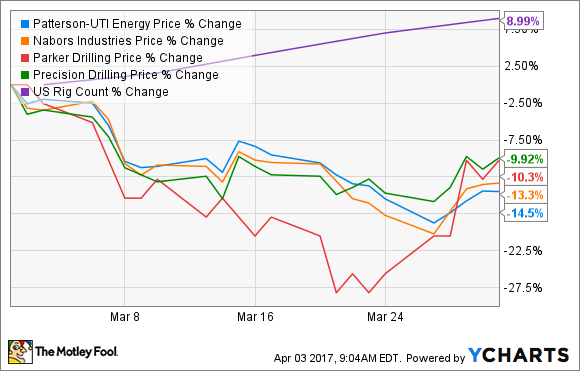 Shares of Patterson-UTI Energy (NASDAQ:PTEN), Nabors Industries (NYSE:NBR), Parker Drilling (NYSE:PKD), and Precision Drilling (NYSE:PDS) all declined double digits last month. Wasn't the onshore rig industry supposed to be in the middle of a revival? According to Baker Hughes' weekly rig count survey, active rigs in the field improved 10% in March to a total count of 824. Throughout 2017 thus far, total active rigs have increased in all but one week and are up 25% overall. Behind that backdrop, one would assume that investors would be lining up to buy shares of these companies. Like so many things in the energy market, though, the devil is in the details. Yes, rig counts are going up, but those gains are very much concentrated in South and West Texas, namely the Eagle Ford and Permian Basin. Of the 159 additional rigs that have gone to work in 2017, producers have deployed 50% of them to these two regions. For a company that has a lot of rigs in these two regions, that is great, but it's less great if you have a high exposure to other parts of the U.S. or internationally. Unfortunately for most of these companies here, their assets aren't quite in the right place. Parker Drilling has no rigs in the continental U.S., Precision Drilling is mostly active in Canada, and Nabors has about half of its fleet in the U.S. Most of Patterson's rigs are in North America, but its total rigs are relatively evenly spread across the continent rather than concentrated in this one region. It's also worth mentioning that Patterson is in the middle of acquiring Seventy Seven Energy, which will add 91 new rigs to its fleet. More than half of those rigs, however, are older technology rigs that haven't been finding work as of late. Outside these two shale basins, drilling activity has remained muted. That is especially true in the international markets, where most oil and gas producers are still in capital-preservation mode. Parker Drilling will undoubtedly suffer under this market dynamic, while it wouldn't be surprising if Nabors' and Precision's gains in the U.S. were offset by losses in their respective international segments. These rig companies are an excellent example of why investors need to do their homework before diving into a stock. If we were to only look at the macro trend of rising rig counts in the U.S., one would assume an investment in Patterson, Nabors, Precision, or Parker would pay off. The details of each companies' respective fleets tell a different story, though. For these businesses to succeed longer term, we're going to need to see one of two things. Either these companies need to redeploy some international rigs to the continental U.S., or investors are going to have to wait until a pickup in international land drilling comes back. The chances of the former are pretty thin because there is still a lot of idle equipment in the U.S. Remember, it was less than two years ago that there were more than 1,800 rigs in the field compared to the 800 today. When the international market picks back up again is anyone's guess, but it will happen eventually. The ability of U.S. drilling to grow production at current prices will be a large factor in when that happens. If producers can indeed turn a decent profit at $50 a barrel as many claim they can, then it may be some time before we see any improving conditions for these companies.